THANKS TO AN ANONYMOUS TIP, I caught up with the Grinch after a recent round of golf. The Grinch, as it turns out, has been playing golf four days a week at what is normally his busiest time of year. “So how are things in Whoville?” I asked. 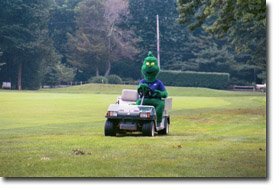 The Grinch has been teeing it up at an undisclosed location, a well-known private club that fears bad publicity if word gets out that the Grinch is a member. And how does the Grinch know so much about the state of golf? Actually, the Grinch doesn’t like golf. “What a stupid game,” he said. “But it’s great for killing time, and I’ve got plenty of it. I do like driving the cart. I even drive it on the greens. So that's the guy who drove all over the greens when I was last visiting Sarasota. It all makes so much sense now.